What do you get when you combine ½ of a cows worth of leather, brass rivets, zippers and foam? A Gard Bags baritone saxophone gig bag of course. 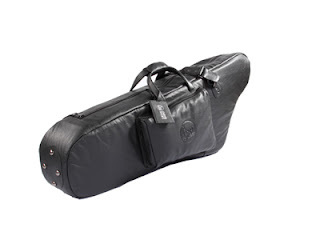 Gig bags are colloquially called “repair man’s best friends” but in careful hands and under ideal situations this type or protective case can be both protective and convenient for a musician who has to carry their horn long distances by hand. For example, it is not uncommon for me to have to park my car several blocks from a venue if playing downtown. As you might image I would never leave my horn unattended at a venue for load-in. After many a strained shoulder, pulling, carting and carrying my Yamaha bari’s coffin case I needed something more convenient. Convenience was judged on a few criteria specific for my needs. The first is that it had to offer reasonable protection from minor transportation bumps. Secondly, it had to close securely and remain closed while be carried. Thirdly, it had to have lots provisions for easily carrying it when the horn is inside. Fourthly, the case and horn had to fit into my very small cars only available space, the front passenger seat. Fifthly, the empty case had to fit into a storage crate in a small closet at my home. Because my bari spends the majority of its life in either its stock Yamaha case or on its stand in my home I wanted a case that offered enough protection that the act of driving to the gig wouldn’t misalign keys or tweak long rods in any way. The case features padding between 2 and 3 inches thick in some areas and will compress enough to absorb some minor impacts. The foam is much more forgiving than the Styrofoam material in the original case. If you’ve never felt the weight of an original Yamaha case, with its wood construction and aluminum trim, you would be surprised at how much it weighs without the horn inside. This is needed to provide adequate protection to the horn but the problem is that the latches and handles become failure points over time. On my case I’ve had many latch failures in the past 8 years. First the center latches have pulled their rivets out due to the center handle placing flexing stress on the long face of the case and the center latches are closest to the handles. The popped off one at a time then I re-riveted them with backer plates and still the latches would get loose and become unsafe in 1 year. The same with the end handle, over time the vinyl covered blued steel handle would break at the attachment screws after 5 years. I’m on my third handle now. This bag has very heavy duty brass zippers which slide smoothly and remain closed when slid to the closed position even with the weight of the horn inside. As a secondary safety feature the grab handles have a Velcro strap which can bind them together and prevent the horn from falling backwards out of the case unnoticed. Carrying this case is as easy as grabbing the grab handles or using the included leather carrying strap. The grab handles are suitably thick and are comfortable in the hand. The included leather sling strap has brass hardware and there are leather tabs covering both sides of the brass clips. This detail means that the brass clips will never grab or mark your clothes. This is a welcome touch if you find yourself in a suit and tie to play a ska show. There are sets of “D” rings on both sides of the case which allows for a 3 methods of attaching the straps, vertical on either side or crossing from opposite pairs of rings. Crossing opposite pairs makes carrying the case horizontally over a shoulder easier . I often get ribbed for driving a small car and playing one of the largest instruments in the band, the upright bass player is the only person for whom I sympathize and who understands my plight. The Yamaha case is simply gigantic. It offers generous amounts of space for accessories with a large triangular cubby at the bell and a long multi-segment cubby running 4/5’s the length of the body tube. All of this real estate comes at a cost. To transport my horn I have to place it in the passenger side seat with its bow in the foot well then buckle it in. While this is safer than strapping it to a trunk rack it does mean I can’t bring my significant other to a gig unless we travel separately. This case is shaped and fits the horn snuggly and only occupies on ¾ the space that the stock case does. This still means that I can’t take my mate with me but at least I can see out of the passenger side window easier and more safely. Lastly, I live in a small Townhome and space is at a premium. The need for everything to have a place and simultaneously be in its place is great. This case has been folded and unfolded a number of times will no ill effects to the leather or foam though in all honesty I’ve begun to hang the case on a cheap hanger in the spare closet. The case is so light that it will not break a cheap department store hanger. This leaves the case accessible for whenever it’s needed. Another feature to note is the rain cover which is included. The little poncho fits perfectly in the small pocket they’ve sewn into the main pocket. This allows the protective cover to be accessible at any time regardless of the nature of the flying liquid. The rain cover is made from nylon and should be washable in the event a rogue beer should be spilled upon it. TAKE AWAY: This case is a good value and will provide many years of use. It will not protect like a proper hard sided case but with great care you can utilize this case and keep your big baby safe. Belated: Who’s the author of this blog?